The location of this beautiful beachfront Villa is just a few kilometers from the town of Orebic, on the Dalmatian penninsula of Peljesac. It offers direct access to one of the best beaches known in the region which leads out into perfectly clear, turquoise-blue water. The Villa is set within a generous garden of lemon, lime, fig and palm trees which give plenty of cool shade during hot summer days. The edge of the garden leads to a gate after which follow a set of steps directly onto the wonderful beach below. The Villa is approached from the rear where there is parking for up to three cars. Guests walk down a short pathway to approach the sea-facing front of the Villa where the entrance is located. There guests into a large modern open-plan kitchen/dinner/lounge area. On this ground floor level there are also three double bedrooms and one separate bathroom. A spiral staircase leads to the first floor where guests will find two double bedrooms, each with an en-suite bathroom. Both double bedrooms lead out onto a shared sea-facing terrace. The rooftop of the Villa bears yet another terrace. The main attraction of the entire Villa is its exquisite outside area, where guests spend the majority of their time, as it makes of an ideal entertaining area. The patio doors from the lounge lead out onto a large dining area equipped with a BBQ located at the side of the property. In addition there is a comfortable outdoor lounge spot. Both the outdoor lounge and dining areas are shaded by an attractive wooden sun shade. Further forward there is a spacious garden where 4 marble chairs and a table are positioned at the end to enjoy the best sea view. Stairs (about 60, a 40 meter distance) lead down to the exquisite beach and crystal clear water. A short walk away, one of the two beach bars is a relaxing Tikki bar and restaurant overlooking the sea, as well as a scuba-diving centre. Not far from the beach, near the Villa, there is a wonderful sunken ship to view just off the coast. Nearby in the town of Orebic plenty of nightlife can be found as well as restaurants. From Orebic it is a short ferry ride to visit the city of Korcula on the island of Korcula, while approximately 15 km from the Villa there is the coastal town of Viganj, popular with windsurfers. Guests staying in this region can also visiting local vineyards, take a day trip to Dubrovnik or Mostar, and other places such as the National Park of Mljet Island. Peljesac has an ancient maritime tradition and is the home of many captains famous for their skill and bravery on the open sea. It is also well known since ancient times for the fine vineyards, and the excellent sorts of wine, "Dingac" and "Postup", are famous all over the world. Orebic – a small town on the south seashore of Peljesac Peninsula, originally built by sea captains who found this spot to built their homes and villas. It is located on the regional road running along Peljesac peninsula. Back in 19th century, Orebic had one of the largest sailing and shipping societies in Mediterranean but as soon as steam ships replaced sailing ships, Orebic lost it's primate in the field, although sailing itself remains local activity to present days. Orebic is nowadays popular tourist resort, offering various accommodation facilities – hotels, apartments,and rooms, long pebble beaches (Trstenica). -	Live a typical Mokalo morning, waking to the rising Mediterranean heat and stepping down through the shaded garden into the calm sea, after an amazing breakfast. Rentalcars.com can be used to arrange rentals from the airport. Many services can be arranged with my property manager upon arrival. Water taxi service is a wonderful option. They can pick you up from my neighbors Pier. A complete welcome guide will provide you with all extra and necessary info about the region. My Name is Joseph Kustra. I'm a american who moved to Croatia. I have spent every summer in peljesac for the last 15 years. I truly love peljesac. This property has been exclusively listed for the past 14 years via a London agency. A UNIQUE STORY Over a decade ago, after many years of stressful city life and financial markets, this stunning property chosen for its natural beauty was bought instinctively, with a vision of sharing its divine beauty and incredible peace. Purchased the same day it was seen, this waterfront villa, situated between an incredible ancient olive grove, was chosen not only for its impeccable location, but also for its incredible potential to allow holidays of guests’ dreams come alive. The exterior of the property has been restored following its authentic Dalmatian architecture, while its interior has been fully equipped according to top-quality 5-star standards. Villa Kustra is a perfect choice for family holidays, getting away from it all or just letting loose and enjoying complete relaxation. The property has direct access to the beach. WELCOME TO VILLA KUŠTRA Pamper yourself to unforgettable experience in an ancient Mediterranean oasis of tranquility that you will forever treasure in your memory. Loose touch with modern reality breathing in fresh, salty, unspoiled Mediterranean air, all while enjoying one of the most beautiful undiscovered beaches in the Dalmatian region. Experience the picturesque garden providing species such as magnificent oleander and palm trees, pomegranate, bamboo and nuts, as well as biblical olive groves and fig trees. Swing away in the relaxing hammock staring out onto the incredible, untouched Adriatic horizon. Enjoy Pelješac in this carefully designed residence built right on the beach-front exclusively for relaxation and complete spontaneity. OUTSTANDING LOCATION Remotely located off the route between famous Roman-age Split and Venetian-influenced Dubrovnik, the undiscovered village of Mokalo holds barely a couple dozen locally owned properties. Offering remarkable views of the crystal-clear sea and the unique gems of the Adriatic - islands of Korčula and Mljet, the village itself offers incredible peace. LOCAL DELIGHTS The authenticity of anyone’s stay in Croatia only goes further with the astonishing opportunity of truly organic gastronomic experience. Allow your senses to touch and taste only the finest of locally-grown fruits and vegetables, globally awarded wine growing on the steep hillsides of the entire peninsula, delicious home-made cheese and charcuterie, and cold-pressed olive oil you will want to take home.If in season, you may treat yourself to citrus fruits located in the garden of the villa itself. New Linens provided every 7 days. Bathroom and beach towels provided. A traditional wood burning outdoor cooker has been built. We had a fabulous holiday staying at villa Kustra. The villa is spacious, well cared for and has everything you need. Our children (and us) loved having a beach at the back gate, we swam everyday, snorkelling. The steps through the villa’s terraces to the beach are steep - but our 3 yr olds were fine with guidance. The campsites either side are a bonus, you can get a drink and take it to the beach or have lunch under the shaded tables. There were a lot of mozzies when we stayed so pack extra repellent. Orebic, nearby, is a great little seaside town with good ice cream and cafes. Expect beautiful starlit skies (you can see the Milky Way on a clear night), lazing in hammocks or in the many garden areas. You’re in for a treat. Thanks Joseph! Thank you so very much for the kind words. Such a cool bonus to have restaurants and cocktails nearby. My neighbors just opened a winery and tasting room in the village as well. World class vino right in the village. Come back again any time!!! Everything as Advertized and Then Some! Spectacular spot, situated between two beach areas. The food at each was incredible, the beach was pristine. Camping families are all delightful. Getting bread every morning from the bakery truck as a real treat. The house itself is perfect, sizable, efficient and comfortable. So many places to sit and enjoy the view. Boat taxis picked us up many night directly in front of the house! So epic. Nearby Orebic is terrific and the surrounding islands like Korchula are easy to reach and very close by. I could have stayed all summer. This house is a must-stay place. Wow!!! Thanks so very much for the incredible feedback. So very pleased that all the hard work is appreciated. A pleasure to host such lovely people. More surprises coming in the future. Great house, great host, amazing location. Richard, Thanks so very much for the wonderful compliments. Very pleased to hear that you enjoyed your stay. Its such a pleasure to host such wonderful guests. Thanks a bunch for the incredible comments. I fell in love with the property and Peljesac. Its a great honor to share the home. I am planning many improvements in the future. Pool, outdoor kitchen, outdoor bathroom etc. Its a project of love and I am so pleased with the feedback!! We stayed in the Villa in July 2017 with 9 people and it was as it looks in the pictures - stunning. Such an amazing location and Villa. The beach below has the most amazing water colour and rocks that make it a great place for a morning or evening swim or chilling all day. The two camp ground bars/restaurants next door are great value for money for coffee, drinks and dinner. We used the fire place one night to cook a BBQ, rather than the gas BBQ and this turned out perfectly. Marija who looked after the villa was amazing and very responsive if we had any questions. Two must do's when staying in the Villa are to go to Ponar restaurant which is next to the monestary at the top of the hill for sunset dinner and also visit Moro Beach Stupe (great beach club but is expensive). It is super easy to get to Korcula Old Town from the ferry at Orebic sea wall. Thanks so very much for the kind words. I am delighted that you enjoyed your time here. I was very fortunate to have purchased this property back in 2001. There are not many like it . I am so pleased that Marija (Property manager) took such good care of you and your group. She is a sweetheart and a professional. Its great to here that you enjoyed the new beach lounge Area. Come back again any time!! This beautiful Villa is a perfect place to recover and escape from busy daily routine. As soon I arrived there I had feeling I found new home. The management of the property was very helpful and accurate. Every part of the villa is perfectly decorated and fully equipped. I had wonderful time on Peljesac and can't wait to come back at my second home next summer!!! Peljesac is a peninsula in southern Croatia, in the Dubrovnik -Neretva county, just about an hour and a half drive from Dubrovnik. It is around 70 km long and is connected with Croatian Mainland at Ston.It is the longest of all Dalmatian peninsulas, abounding in natural bays, mostly covered with woods, with a coast full of beaches, reefs, bays and fjords. Peljesac was inhabited since ancient times by Illyrians and Greeks, later by Romans and since the 7th century by Slavs. The old historians mention it under the name Rathaneus Kersones, meaning the Cape Lynx. The Peljesac Channel divides the peninsula from the island of Korcula. Scattered like breadcrumbs across the foothills of the dolomites, the hamlets and villages of southern Peljesac evoke an ancient past. The rocks, the vegetation, the groves of pine and cypress - everywhere a sense of timelessness prevails. On the hills above the sea, abandoned villas and gardens, stone walls and columns lie crumbling in the sun. Lemon, fig and almond trees, herbs and wildflowers surround the villages gardens and fields. The historical sea captains' town of Orebic - with its shops, market, cafes and restaurants is on the bottom of the Sveti Ilija Mountain. A footpath into the mountains to the summit of Sveti Ilija begins near Viganj too - Croatia's windsurfing capital. There, seaside restaurants and pebbly beaches attract a lively crowd in summer months. The island of Korcula and Mljet are is just across the channel. Take a 20 minute ride north to Viganj, it is best known for its offering in active tourism, surfing and kiting. The mistral wind in this region has created a miracle and a top destination for surfers. Sign up at the Camp Adriatic information booth. Right here in Mokolo, you can get your diving license and go out daily where there is a sunken ship to see. 2. Go on a wine tour of all of the wineries in our area. Just hop in the car and drive south, you will stumble upon many on the way. Our favorite red wines are of the Dingac varietal. Matusko winery is a must!! 6. Lamb Sunday at Restoran Vrgorac-www.vrgorac.com, call in advance to reserve a space. This is a must, fresh lamb dinner right of the spit. They also serve the best stuffed meat cabbage we have ever had anywhere in Croatia. 7. Fish Picnic offered by Restoran Vrgorac. Spend a day out on sea touring all of the local islands including Korcula. Enjoy an hour stop for a fish picnic where the Captain turns into a chef and cooks fresh fish for all on board. Complimentary wine served the whole trip and there are many opportunities to cool off and jump into the sea for a quick swim. This is by far one of our favorite things to do every summer. The views from all angles all day are gorgeous! Pick up tickets in advance at Vrogorac Restoran, they are located10 minutes past Orebic on the right hand side. 8. Take a drive up to the Franciscan Monastery above Orebic and enjoy the most breathtaking views in all of the region and stop in for a visit to the Church of Our lady of Angels. 9. 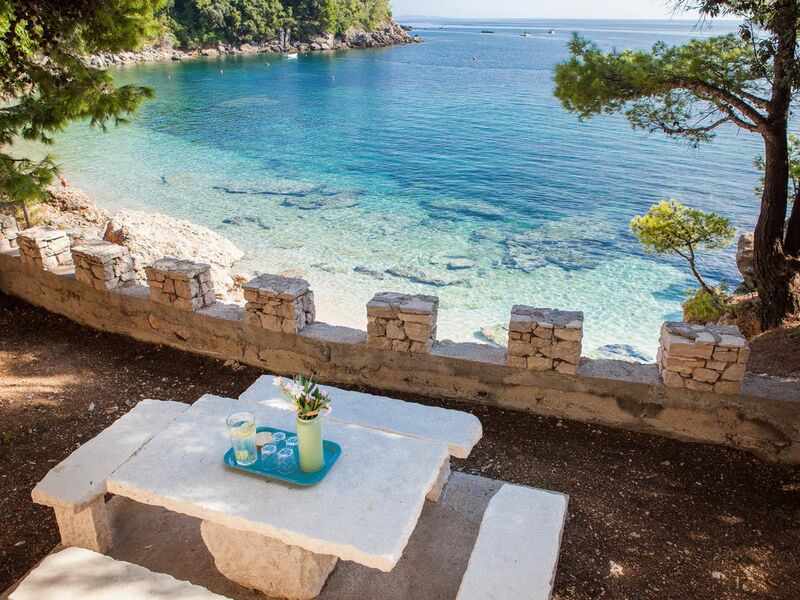 Pack a lunch and go to Divna beach on the north side of Peljesac. 10. Drink large amounts of Dingac and get Frisky!